When The Hermit Tarot Card appears in your reading he can symbolize a need for your careful consideration of issues. Quite possibly a strong desire for peace and quiet and most importantly solitude. He warns us all against making hasty decisions. The Hermit recommends taking advice from someone you trust before making any decisions. This is especially important if you are emotionally vulnerable. The Hermit Tarot Card indicates a time of convalescence and rest especially in regards to health. Negatively, The Hermit can imply arrogance and obstinacy. Suspicions and a refusal to accept advice is often a big problem. This is more concerning when good help would be beneficial to you. Another negative aspects of The Hermit Card is impatience which ultimately leads to bad decisions and loneliness. Be careful when this card makes an appearance in your reading and discuss further with your reader. The Hermit Tarot is a key part of a tarot deck. It is the ninth trump or Major Arcana card in a tarot deck. This is one of many cards that is utilized with the intention of analysing one’s life and the way how it is going to be led in some form. Part of this includes how it is being used today or in the future and in some cases can be symbolic of a person’s current behaviours or how an outside force is going to potentially impact one’s life. The Hermit Tarot card is typically related to introspection. This includes the need to analyse whether a person is being positive in some way with regards to being alone. In some cases it might be reflective of a person searching for purpose or meaning. In other cases it might be symbolic of being antisocial and trying to isolate oneself from all sorts of other things in one’s life at large. The meaning of the card can vary and is always important for a person to explore. 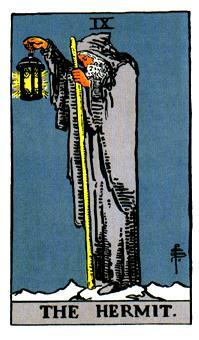 The Hermit Card shows an older man who is standing on top of a mountain. The mountain is a symbol of the many accomplishments that he has made in his life. In some cases it may also be symbolic of how he has tried very hard over time to keep on moving forward towards reaching his desire to be enlightened or to continue to stay enlightened. He is also seen holding a lantern. The lantern itself has a star that features six points on its body. This is the Seal of Solomon, a symbol in the Jewish faith that was known to give Solomon the power to fight and control demons and to even communicate with those that others may struggle to interact with. He also has a staff in his hand. It is symbolic of the initiation that one has to go through in order to advance. The fact that it is in his left hand in particular is important as it is a sign of the subconscious mind. Some snow may also be found around the Hermit’s feet. This is an additional part of the mountain but it can also be reflective of how he has attained enlightenment and holds more than enough experience that he may end up sharing with many other people who ask for it. Also, the Hermit has a grey cloak. It is one that shows that he is invisible in comparison with others around the world and that he is willing to stay secluded from the rest of the world. The background on the card is also completely blank. It is dark in colour and matches up with the Hermit’s cloak in some way. The background shows that he is above all else in the world in his travels and that he has risen over many of the different things that he is trying to explore and think about over time. The best way to explain the man in the Hermit Tarot card is that he is a person who has gone through the journey to go from one’s normal life to reaching enlightenment. He is worn from his travels and he understands what it is like to be alone. He has returned to the world at large and is enlightened with regards to what he knows about looking for some kind of purpose in his life. The fact that this is the ninth Major Arcana is also relevant to the card. The Hermit Tarot card is ninth and therefore symbolic of how one has attained one’s goals and is looking to find an answer with regards to learning the truth about one’s life and how it can be led. If the Hermit Tarot card is upright and in a positive position then it will suggest that one is in the middle of a period of introspection. That is, the person is trying to figure out in some way what one’s life is like and how it is being followed. The person wants to understand things in one’s life but wants answers in a way to where that person will be fully aware of how life is to be let and what needs to be done in order to be positive and respectful to the entire world at large. The information that is covered in this card can really make a difference in one’s life if it is followed properly. In addition, the person is someone who will often need to think about one’s life and might have to be alone in the future. This feeling of being alone is not going to be a sign of loneliness but will rather be a point where one is going to have to separate oneself away from others in the world. This is all being done as a means of creating some kind of support in one’s life in order to avoid serious problems that might come around in one’s life. This can really be sensible and understandable for the demands that one might hold in life and how it is going to be led. A time for meditation is especially to be emphasized in this case. The meditative nature of the Hermit Tarot card suggests that there is always going to be a desire for one to be quiet and to think about how one’s life is going to change and become influenced in a rather positive manner. Sometimes this may even be required as a means of fixing problems as they show up. Compassion is also a sign of the upright Hermit Tarot card. It is a sign of how a person is going to look for ways to help people and will be extremely respectful of those who ask for one’s help. The person who draws the card will potentially become a real positive influence on others over time. There are often times when the Hermit Tarot card is going to be revealed in a reversed fashion. That is, the card is going to be upside down. In this case, it might entail isolation. This means that the person is either shielding oneself away from others or one’s troubles or is planning on doing so. This is a counter-productive move as it means that the person is failing to do anything in order to actually fix the problem. The person appears to be far too self-absorbed and is refusing to let other people come in to help in some way. In some cases this might also suggest that one is stuck and alone for far too long. That person is willing to make some real changes in one’s life as a means of trying to fix problems and other commonplace issues in one’s life. It can be a real challenge for some people to manage this but it is a crucial aspect of life that might have to be explored in some manner. The key lesson that might be explored in this card is the need for a person to try and fix one’s life from the inside. It means that a person needs to look into one’s life and understand why some problems might have come about. This can be influential to one’s life and is worth exploring in terms of how life is to be led. It shows that some solutions have to be found in order to get to some new place in the future. Sometimes the reversed Hermit Tarot card may also be a sign of the loneliness in one’s life. It might be a sign of how a person does not appear to be all that happy or positive about one’s life and is not willing to do much of anything in order to keep one’s life in check. This is a critical part of life that must be improved upon or at least addressed in order to potentially have a stronger life as it is. This especially reflects upon a person’s willingness to develop a better relationship with other people. For instance, a single person who draws this card when it is reversed may be interpreted as a person who could be alone in the future and will need to find a way to resolve this problem. This can truly lead to some behavioural changes but whether they are going to be positive or negative in the view of that person over time will remain to be explored in the long run as one attempts to change one’s life. This is one of the more interesting cards in the tarot deck as the Hermit Tarot is not something that is associated with negative thoughts. It is rather reflective of a person’s desire to be alone and to think about different things in one’s life on one’s own. This can be a good and helpful card that will illustrate the behaviors and attitudes that one might hold over time. It must be explored regardless of how it will come up as it is being drawn out of a traditional tarot deck.